After having some torch tip issues, I was able to get new torch tips and finish 5 birds - 4 in progress birds and 1 new bird. 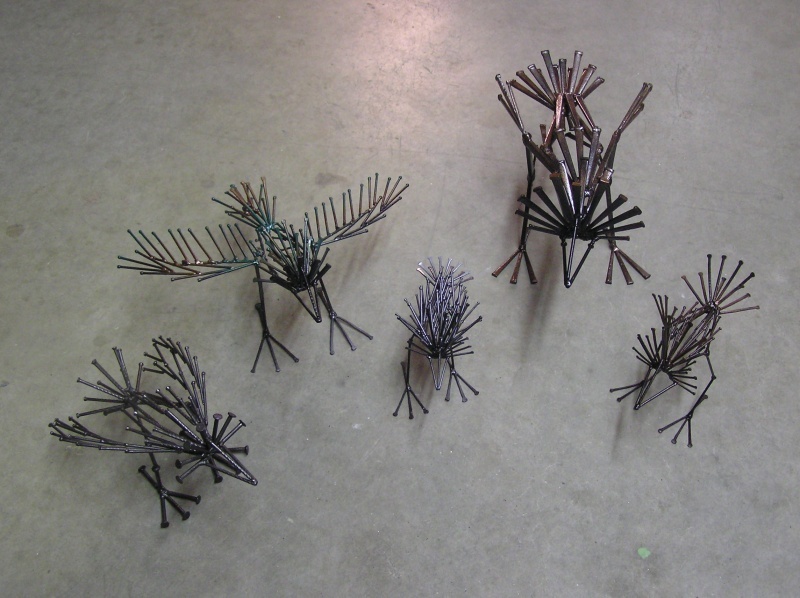 I was busy welding Sat and today and spray-painting all birds today. I did start a 6th bird but decided to wait till Monday. It feels so good to finish all those twittering birds that were perched all over my studio. Even the Flying Hedgehog bird got painted, in shades of black, copper and dark green. My favorite is the two small ones - Bristling Baby Bird and Quilly Bird. When it comes to torches, you cannot mess around. I use oxygen/acetylene welding torches for gas welding, as it is known in the welding trade, and straight acetylene for brazing torches for jewelymaking. Welding torches have temps that go up to 6300 degrees while brazing torches ( or jewelry torches as they are known) go up to 2000 degrees. When you work with steel or iron, you need a welding torch to melt steel at 2300 degrees or higher. If you work with silver, gold, brass, bronze, nickel or copper, they all vary between 1600 degrees to 1900 degrees for copper for the melting point of each metal. Gold, silver, brass and bronze generally are around 1600-1762 degrees, so we jewelers work in a 1200 to 1450 degree range when we solder the metals together. When you work with such high temperatures, even 2000 degrees seem low. You do have to be careful not to touch any metal that is on a soldering block and I'm in the habit of always using tweezers to pick up any metal. You have to constantly check to make sure torches and gas tanks are not leaking, that all connections are tight, the hoses have no holes and secure tanks so that they don't fall over. If you knock over an oxygen tank, it will turn itself into a missile, since all the oxygen is trying to escape at once, the tank literally blasts thru any obstacles. I've never had any tank issues since I'm always aware of that and make sure that my tanks don't get banged around. If you ever wonder why propane tanks are always outside, it's because propane is a heavy gas, it sinks to the ground and pools at the lowest point. The slightest spark such as flipping a light switch can cause an explosion. Acetylene, on the other hand, tends to dispere if there's a leaking tank, so it's easy to clear out a room if there's a gas leak. That is something that rarely happens. Anytime I start teaching soldering, I always ask my students if anyone has a fear of fire. You'll be surprised at how many people are afraid of fire and I don't push it if a student is really fearful of fire. Fire doesn't bother me since I'm so used to working with it. In fact, I joke that I have torch in one hand and hammer in other hand, since torches and hammers are my favorite tools. One of these days, I'll write a blog about the wondeful world of hammers. In the meantime, enjoy the twittering birds.